From last-minute cross country schooling to packing the trailer and meal planning for 10 people, an overwhelming amount of work went into my first overnight event with my horse, Diem. But, when all was said and done, it was one of the most fun shows I’ve ever done, and I want to do it all over again next weekend! 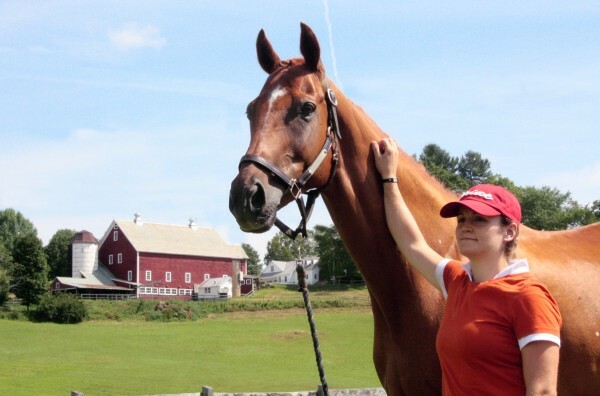 The four-hour trip to GMHA (Green Mountain Horse Association) went smoothly, and we quickly unpacked and got ready for our first ride on the gorgeous show grounds, nestled in little valley in South Woodstock, Vermont. Diem typically has a level head, but he showed his true thoroughbred colors this weekend. He was so busy taking in the hustle and bustle that he was a tense bundle of energy for most of the ride. We worked through it and finished on a somewhat relaxed note. Dressage warm up was nothing short of a disaster. Diem showed off some fabulous canter-to-buck and walk-to-rear transitions (unfortunately, neither are in the Novice dressage test.) It wasn’t the day to show off the progress we’ve made on the flat – it was a day to try and stay in the saddle! My trainer helped me stay calm and work through the rough patches. The test was by no means beautiful, but it was the absolute best it could have gone given the warm up. If the morning was a disaster, then the jumping warm up was catastrophic. I couldn’t walk around the ring once on a loose rein, and trotting turned into cantering, spinning and halting into trees. I felt like I should just throw in the towel and chalk the whole thing up to experience. Once again, my trainer talked us calmly over some jumps, getting both Diem and I into a much better mind frame. 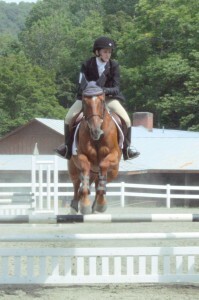 In the stadium ring, Diem settled into a nice canter and we sailed around the course double clear. It was not just a nice round considering his earlier antics, it was a very nice round overall! I didn’t know what to expect on day two for our cross country trip. Because it’s my favorite phase and the easiest for both of us, I wanted it to be fun, not stressful. I found a quiet spot to warm up, and was able to walk, trot and canter on a loose rein and on contact for the first time all weekend. I finally had my horse back! Right out of the start box, Diem picked up a relaxed canter and locked on to the first Novice fence, though I think he would have jumped the Prelim fence had I pointed him at it! He took the next hedge easily, had a look at the first water crossing, and from there, switched into his cross-country mode for the rest of the course. Uphill, downhill, ditches, banks, water, combinations – he was game for anything, and he jumped every fence out of stride. As soon as I was finished, I wanted to go again. 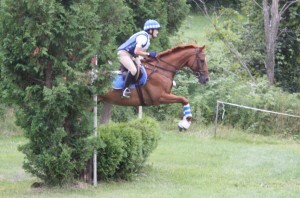 I finally remembered why I love eventing with my horse! The GMHA horse trials were a wonderful experience. I loved cheering on barn mates, relaxing around the show grounds and swapping stories with friends after a successful day at the horse show. Diem and I learned so much, and in addition, had excellent jumping rounds. I can’t wait for our next event! I loved reading about your weekend! Congratulations! 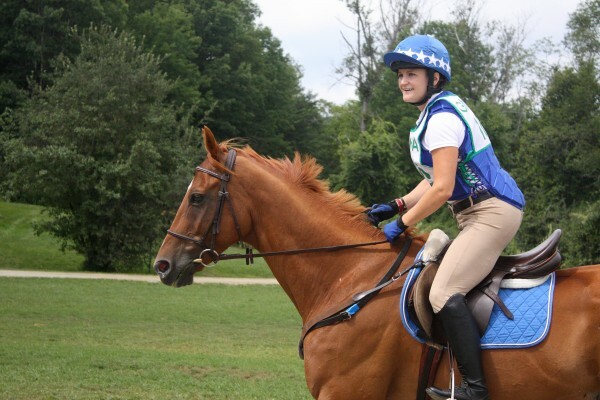 You show the kind of dedication and attitude I hear so much about in the eventing world. 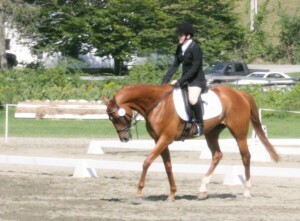 I’m an older rider…dressage…turned western, now back to dressage. Reading your story has me very excited about doing some combined training with my little QH mare. Thank you for your inspiring story of perseverance and committment. Tips for newbies appreciated! Good luck in the future!